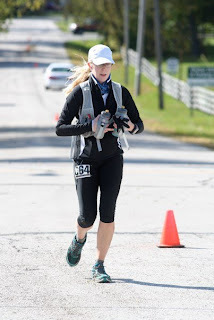 Serious Case of the Runs: Glacial Trail 50k: Double Shwag! That said, Glacial Trail 50k rocked my world!! Pun intended. This trail is no joke. It is covered in rocks, roots and trail crud, then covered in a beautiful layer of freshly fallen golden leaves. It was a "baby leap of faith every time your foot hit the ground," according to Geof. True story. Geof and I spent a few hours in gridlock heading up to WI Friday night where the unexpected awaited us...a ridiculously awesome show at Cafe Carpe, in Fort Atkinson, WI: Brooks Williams. Cafe Carpe is the sort of intimate, deliciously quaint and cozy venue you'd expect to find hidden in the black hole of Portland, ME (pretty much heaven)...mismatched furniture, eclectic artwork on the walls, the owner pouring your beer for you, very low lighting, and absolutely perfect. I HIGHLY recommend you check out both Brooks and Cafe Carpe :) Saturday was another supreme day spent drinking multiple cups of Andrea's coffee talking about everything under the sun, relaxing in Geof's dad's loungers, grabbing a late lunch and then heading up the rest of the way to Sheboygan where our rickety hotel room awaited. After getting everything laid out for the race, we grabbed a steak and 'tater dinner up the road and then turned in. It was a slightly restless night for me for some reason. I kept thinking about a creepo breaking into our room. And bedbugs. So, I didn't sleep a whole lot :) Around 5 a.m. we hopped in the car and headed to Greenbush, WI, about 20 minutes up the road, to check in and get ready to rock! RD Robert Wehner is awesome, by the way. He totally loves this race and makes sure everything is just right. He even knew our names! After getting our sweet sweatshirts and numbers, Geof made the final touches and we headed out for the 50 mile 6:00 a.m. start. I watched him off until I couldn't see him anymore, disappearing into the cold, dark morning. Back inside the Greenbush Community Center (which is awesome! A large, heated building with clean bathrooms, sinks, tables and chairs...the PERFECT ultra headquarters!) I changed into my running clothes, pinned the number on, and then waited. The 50k wasn't starting until 7 a.m., so I was getting antsy, and so was everyone else around me. Juli Aistars came over and introduced herself and we chatted for a bit...it's about dang time I met Juli! We've been at most of the same races this year and never ran into each other! I should mention it was cold as a motha! I think it was 28 degrees at the start, with a 'high' of 45 expected for the day. It was like an ice bath...in the air. All 70 of us 50k playas lined up and waited for Robert to say "go!" and then we were off, heading about a 1/2 mile up on pavement before we would hit delightful trail. At the start line...the sun was finally up, but it was still COLD! I have on my brand new Atayne CHUG shirt underneath and boy was it a lifesaver, keeping me warm and dry! I wasn't sure what to expect, or even hope for, in this race. I had kind of eliminated all but the long runs from my 'plan' in the last few weeks leading up to Glacial...a couple 20+ milers and a bunch of 10-milers. Was that going to be enough? Meh, I guess I would see. I was having trouble trying to prep for this one the night before...what do I eat, what do I drink? It's been since July that I've raced! I also had the feeling that I wasn't "respecting the distance." 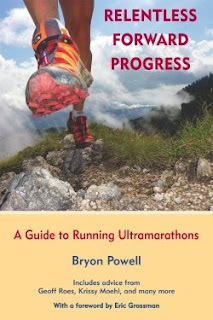 After you've run 100 miles, even if only once, you kind of develop a different approach to a lot of things, but especially running. Suddenly, it's "just" a 50k..."just" 50 miles. I was worried I wasn't preparing enough. The aid stations on this particular course were going to be spread out a lot...roughly every 7 miles...so I was going to need to be largely self-sufficient. Totally cool with me, I kind of prefer that. Geof and I both made a bag for the one drop bag AS (it is an out-and-back course for both distances), but I wasn't sure how much I was even going to use it. Nice to have it just in case, though. I prepared one bottle with Clip2 in it, and one bottle with a controlled mix of Gatorade (the blue Frost flavor...yum! ), then I carried all the gels, Clif Shot Bloks and S!Caps I was going to need the entire race in my vest, as well as more Clip and Gatorade. Turns out I was more ready than I thought :) Never a bad thing. After 5 or 6 miles, I got into a great rhythm running with Dorn and Juli. We were moving great and running the hills. After a bit, we passed up Dorn and from there on Juli and I were two peas in a pod! She got to witness my first fall of the day...I landed on my right side, landing my right knee in a cushy bed of mud, phew! The second AS, mile 13.3 (Butler Lake? The one with the drop bags) I decided I needed to pee. No potties, and no good spots to go, and after I wandered around the parking lots scouting out pee spots, I decided it wasn't all that important, so I grabbed my bottles and headed out. Dang it, Juli already left. I decided then and there that the lesson of the day was, stick with Juli, she knows what she's doing! So now I was on my own, but my goal was to catch back up to Ms. Aistars somehow. At the turn around, there were two dudes sitting in plastic chairs in the middle of a little opening in the trail. They told me it was my turn around (at 3:02, woohoo!) so I pivoted around and continued back as they yelled, "it's pretty much the same thing on the way back!" To which I replied, "that's cool! Bring it!" So the trail totally "brought it." After leaving Butler Lake I was on my own for a bit, between miles 17ish to around mile 21ish. Admiring the landscape and thinking, "man, I need to take more pictures!" because everything looked so cool up top. Coming down from there, you head into a nice field section, but you're flanked by tall prairie-like grass on either side of the single track. Crossing over some little bridges and just about making it out of a little muddy section, I looked up for a moment to see Juli and company up ahead in the distance, and then BAM! Down for the count! I laughed outloud because I fell on my left side this time, and my ear now had mud in it :) Thank goodness it was the left side because I had a can of Starbucks Doubleshot in my right jacket pocket for safe keeping! After gathering myself and getting vertical again, I really put the hurt on and decided I was going to catch back up to Juli and the gang of chicks she was leading. It was time to make up some time! Just after the open field section, I caught up and hung around for a bit with the girls as we headed back into the woods. I was tripping on rocks left and right, catching myself and almost falling on the heels of the gal in front of me more than a handful of times, sorry about that! I decided I felt pretty bad about that, but I didn't want to slow down. So that meant I needed to speed up. I moved up the line and joined Juli, and from there we separated from the pack. After hearing Juli mention to one of the other women that if they kept moving at this same pace, they would break 6 hours...hoodaddy, I like the sound of that! My "whisper" goal, as Geof would put it, was 6 hours. Yea, well, I wasn't sure how possible that was, so at about the turn around point, I had redrafted that plan and decided that I was going to be thrilled with 6:30, which would still be a PR, by 27 minutes. Doable. Juli and I started getting antsy for the final aid station, letting us know we would only have 7 more miles to go. Just before the station, we got to an awesome downhill section. I let my legs go and do their thing, following Juli stride for stride. Halfway down the hill, I did it again. Got my right toe caught on another rock. HO-LY crap! This one takes the cake, over all other trail crashes I've had thus far! It was violent, painful, and maximum impact. I landed on my right shoulder and hip then continued to roll down the hill, water bottles flying in opposite directions. I finally lost momentum and stopped and Juli turned to see me laying on my back. I think I was laughing from shock. Was that an unfair advantage, rolling down the hill? I had leaves in my hair, bloody, muddy palms, a welt the size of a golf ball on my right knee, scratches up my right leg and my hip felt geriatric. That was a doozy! Onward we plodded, picking up the pace a little more, and then the AS appeared. I really wanted to keep 6 1/2 hours in sight, so after a quick bottle refill and one more slice of apple with peanut butter (that's all I ate all day at any aid station), I decided to head back out. Juli was getting some soup and I was sad to move on without her, but I knew she'd be just dandy. I started to pick peeps off slowly but surely. I wanted to apologize as I did this because it is so unlike me, but I'd be lying if I said I didn't secretly enjoy it! Finally, I reach the most glorious scenery of the day...the road home! That meant only a 1/2 mile left to the finish. I passed one more dude walking, turned the corner and there it was. Robert in all his blonde glory standing at the finish line. I knew I had passed 6 hours, but I didn't care, I was done! I crossed the line in 6:12:03, greeted by a handshake from Robert, and, after checking his clipboard, he handed me a handmade mug for coming in 5th female overall, and a finisher medal. I didn't really think about the whole 5th female thing at first. Turns out I was 5th out of 20 chicks, whoa, where did that come from?! After I caught my breath I announced that I just got myself a 45 minute PR to which Robert said, "on MY course? You got a PR? Congratulations!" Joy of joys, a PR, on a ridiculously tough course! And a cute mug :) After a quick change into about 12 layers of dry clothes, and still shivering, I hung out in the race HQ with Juli while I waited for Geof to come in. Before too long, I was ready to head outside to try and catch him crossing the finish line, when I turned around and there he was! Nice! Geof got himself a cute little mug too, 7th male (7th overall in the 50M), and a 50M PR in 9:03. That's how it's done! I guess we woke up with our running legs on afterall :) It was a PR kind of day. We sat around a little while Geof got some warm food and we rehashed our races for each other. John came over to introduce himself and let me know he's a fan of my blog...AND that he'd just finished his very first ultramarathon! Way to go John!! What a GREAT race, no joke. I can't believe how good I felt the entire time; my nutrition was right on, and I really pushed myself more than I normally would have. It felt good! I had a fantastic time getting to know Juli, meeting Mary Gorski in the hallway after the race, even crashing on the trail had its own virtues :) What a fun day, and even better to share it with Geof, even if we were in different distances :) One thing is for sure, we will be back again for this one! Congrats! I've kissed that trail unintentionally, so I know how hard it is - a PR there is great. Wish I could've been there, but I've recently discovered I can get injured without crashing. Thanks Danni, Steve and John! John, congratulations again on your first ultra, an accomplishment made even more impressive by the fact that you've started up when you have :) That's just awesome! Paige!!! Trampling the weak and hurdling the dead! Taking no prisoners! That's what I'm talking about. Seriously excellent race!! Congrats on another good one. Congratulations and nice race report! You made MY day! Not only did I finally get to meet you, but I enjoyed spending all that time with you... You will be breaking this PR the next time you run 50K. You've got what it takes! Have fun at JJ and say hello to Jamil and Nick! Weeeeeeee! Thanks D-Ray and Juli :) I'm learning there is a direct correlation between the speed at which you run a race and how long you are 'feelin' the burn' afterwards :) But it was totally worth it! Heya, Kelly, thanks! Oh boy, a PR at NF50? Well, hopefully I can get these legs moving properly by then :) I hope you're getting excited for your first official ultra! It's going to be so much fun and I'm excited to witness it (even though you'll be done with your race waaaaay before me)! Daaaang! A 45-minute PR? That is HUGE! Amazing job out there, Paige! And OMG, 5th place female? You are absolutely incredible (and also my hero)! Congrats, girl! Way to "Rock" the course. You two need to do more races together. It's a winning combo.. Congrats! See you both at NF. Thanks Jim, and thanks for stopping by Trailgrrl-ly girl!! Geof and I are already contemplating the race schedule for next year...could be a busy running year for us! !